In today’s interconnected, global society, students – especially students in communication – need exposure to international settings and experience in international issues in order to identify employment and to further be successful, effective professionals. 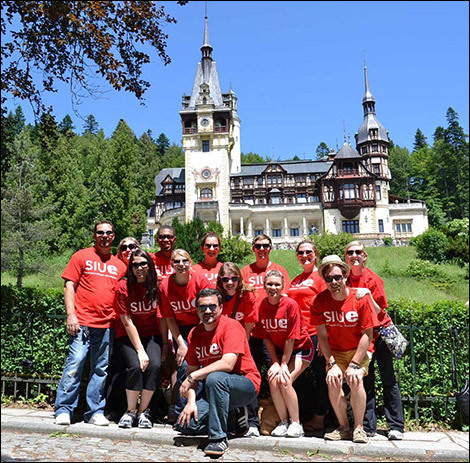 In recent years, faculty of the Department of Applied Communication at Southern Illinois University Edwardsville have strived to offer summer faculty-led study abroad courses that allow students to have hands-on experiences or experiential learning activities related to international and cross-cultural aspects of their future professions. In 2012, with support from an Excellence in Undergraduate Education (EUE) grant, Dr. Sorin Nastasia offered the first study abroad in the Department of Applied Communication Studies, which took 12 students to Lyon, France, and Bucharest, Romania. The course, an SPC 419 Special Topics in Speech Communication entitled International Public Relations, gave students opportunities to experience and reflect on public relations and strategic communication practices in the two countries, one in Western Europe and one in Eastern Europe, as well as to get a taste of the local cultures. In France and Romania, the students spent time in workshops with professors and students at local universities and in hands-on activities with professionals at country-based public relations firms as well as local headquarters of international public relations agencies, and they also enjoyed learning about history and culture through visits to historic and cultural sites. In 2014, Dr. Sorin Nastasia offered the International Public Relations course for a second time, in Munich, Germany, and Budapest, Hungary. In Germany, the nine students enrolled in the course had the opportunity of contributing as communication experts on the organizing team of the 50th edition of Prix Jeunesse International, a festival of television for children which takes place every two years under the auspices of the Bavarian Broadcasting Corporation. Additionally, in Germany, the students spent time in workshops at a university in Munich, at the communication unit of BMW, and sightseeing at the Bavarian castles of Linderhof and Neuschwanstein. In Hungary, the students spent time at Corvinus University, at a public relations firm, at the communication unit of the City of Budapest, as well as sightseeing in Budapest, at Lake Balaton, and in the town of Szentendre which is well known for its artists’ colony. Dr. Nastasia intends to organize another study abroad course to Germany and Hungary in 2016, when the next edition of Prix Jeunesse International will take place in Munich. Other faculty members, for example Dr. Isaac Blankson and Dr. Zach Schaefer, are also in planning stages for future study abroad courses that will benefit students of the Department of Applied Communication Studies.